Safety is fast becoming the top priority in product design – be it fire, environmental or health concerns. 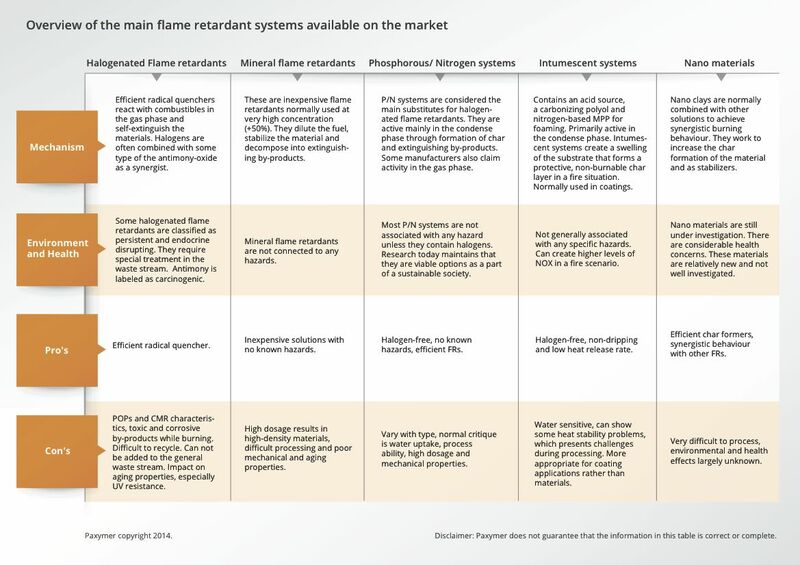 Many multi-national companies have already restricted the use of halogenated flame retardants in their products. It falls to converters and compounders to find viable solutions. In order to create a current product with a long lifespan, it is essential to meet new burning standards and cause no harm to human health or the environment. Paxymer helps you meet cutting edge standards for function and fire safety, free of any toxic chemicals. Consequences to environment and health are paramount and manufacturers have legal responsibility for the product they put on the market. In this era of greater transparency they are also subject to intense scrutiny from media as well as the public. Increased responsibility for material composition gives companies the opportunity to set themselves apart by providing the customer with safe products that generate added value through new green certifications. The European Union and UNEP are currently implementing restrictions on the use of hazardous substances. Several brominated flame retardants are already banned under the Stockholm Convention, due to persistent bioaccumulation and long-range environmental effects. Such compounds accumulate in the human body and are passed down through generations, resulting in severe health problems. There are indications that they can be endocrine disrupting and carcinogenic even in very low doses. Research also shows a correlation with mental illness, ADHD and several other serious health indicators. Environmental and health concerns are under increasing scrutiny – the business risk in neglecting these areas is considerable. Bans are likely to force rapid, costly substitutions for current solutions. Risk assessment procedures are increasingly common at the product level. These judge the product on every aspect, from fire performance to environmental impact and human health, which has far-reaching implications for manufacturer responsibility. In the 1950s the average time to flashover in an apartment was about 15 minutes. In the early 2000s, lethal conditions could occur after only 2-3 minutes, giving you only that much time to wake up and get out in the event of fire. This drastic drop is attributed to increased use of polymeric materials (e.g. plastic) and the additives used to modify them. Correctly designed flame retardants improve all of these parameters. Designed incorrectly they can have the opposite effect. One example of the latter would be the release of thick, toxic smoke from halogenated flame retardants in a fire. Halogenated alternatives deteriorate smoke- and flame-spread properties further. The holistic design of Paxymer addresses all of these issues. 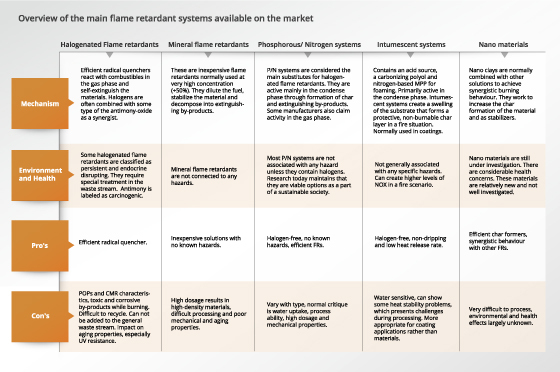 Conventional flame retardants don’t meet these criteria, which is why it is necessary to implement new solutions – such as Paxymer. 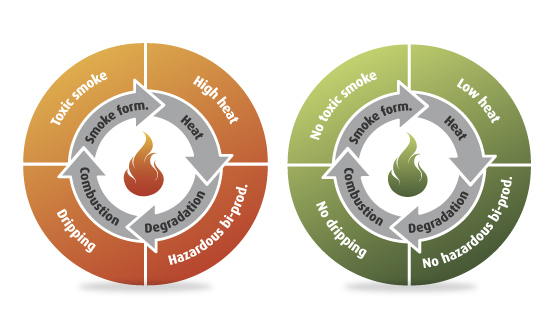 We take all three main parameters for safe burning behavior into account in the design of our system. Paxymer achieves safe burning performance through low smoke and heat-release rates and non-dripping composition. At ignition a flame generates heat, causing the material to decompose. Decomposed material is combustible and further fuels the burning process, generating still more heat. This process will escalate as long as there is enough oxygen. The flame retardant must halt this cycle to extinguish a fire. Stabilize the material; prevent the initial ignition and degradation. Extinguish byproducts of reactions in the substrate, or condense phase; or form a non-burnable char to act as barrier between the heat source and the remaining fuel. Dilute reactions in the gas phase or react with the combustibles formed during degradation so that further burning isn’t propagated. This causes the material to self-extinguish. Paxymer® combines all of these mechanisms to increase efficiency and minimize the hazards in the burning process while conventional technology focuses on only one of these strategies. Burning properties are often taken into account at the very end of the design phase. This can create significant problems and delay your product launch. Include flame retardants from the start to simplify and shorten your development process. Otherwise mechanical properties will have to be re-tested, Conventional solutions have known issues with impact and aging properties. Make sure to know which standard you need to fulfill and test for. There is little correlation between different fire standards. This way you will optimize the price performance of your material for your application. Plan a test run to optimize processing parameters and test several dosages of the flame retardant in one go – this allows us to find a good solution faster. Rank your demands on your material specification. While it may be nice to get “everything” this comes at a price. Expect a price impact. Discuss the added value of flame retardants with your customer. Last but not least: Involve your material supplier early on. Paxymer is designed for ease of use – our goal is to be a drop-in solution in any process. Testing and verification of crucial properties is nonetheless always required. We have the experience and capabilities to guide you in these processes. Where does Paxymer fit in? Our system is designed to maintain mechanical and processing properties and to achieve a safe burning process with minimal adverse impact on environment and health. We have a multi-mechanistic and novel approach, that utilizes the pros and minimize the cons.